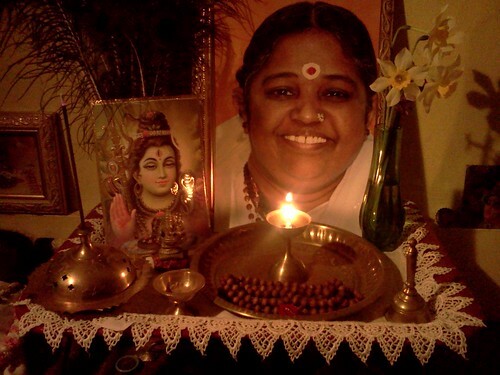 Amma is a wonderful teacher with many devoted students, but does everyone need a guru? What does that even mean? Well, hello there! This is the final part in my series on the whys and hows of meditation. In my years of meditating and practicing yoga, these are some of the questions I’ve come across, which many beginners may be wondering about. Do I have to be religious or spiritual to meditate? Is this a religion, or does it conflict with my religion? No. Although yoga has some connection to Hinduism, it is not a religious practice. Many people of various religious and secular persuasions find that through meditation, they gain a deeper understanding or connection with the world. I know many atheists who meditate as well and enjoy the benefit of cultivating a calm mind. Can meditation help me deal with headaches or other types of illness? Yes, it can, especially if that illness is related to stress or anxiety. Experienced meditators can control their breathing, slow down the heart rate, release tension in the body and intentionally create a state of relaxed awareness, which helps relieve headaches, lower blood pressure, and improve digestion among other benefits. Remember, the stresses of modern life affect us on multiple levels. When the mind is anxious, the body responds by becoming tense–the stomach ties itself in knots, the shoulders scrunch up to the ears, the eyebrows furrow–and this is how we start to feel old, sick, and tired. Meditation trains the mind and body to relax together, which begins to pave the way for healing. While I don’t recommend disregarding your doctor’s orders, meditation certainly can enhance the effectiveness of any treatment, and it’s excellent as preventative maintenance. Do I have to have an altar or special meditation space? No. The only thing truly required for meditation is the present moment. We see people sitting a certain way or chanting Sanskrit words, and we call that meditation, but we have no idea where their minds are. It’s a completely internal experience. We see images of incense, silk robes, malas, ashrams, mandalas, whatever. Those things are all just accessories. They can be helpful because they are attractive and they give you something to focus on. Some people really love using malas (prayer beads), for example, and that’s fine as long as you don’t confuse the object for your practice. No amount of fancy Buddha statues will make your meditation any more deep and serene if you don’t sit down and practice. Why do you personally meditate? Because meditation, in combination with regular exercise and good nutrition keeps me sane and healthy. After years of struggling with anxiety and depression, I discovered something that made me feel human, and I loved it. I finally have a way to find peace in the middle of a panic attack, and if you’ve ever had one, you know how priceless that is. Why do you chant things in Sanskrit? The mantras we use in meditation are ancient sayings used to focus the mind and bring about a peaceful state. Om is probably the most common chant you hear. Om is the sacred sound or the sound of creation. The Gayatri Mantra is a prayer to find your true path or dharma. Others are prayers for the wellbeing, liberation, and nonsuffering of all living things. Some people believe mantras have power on their own, even if you don’t know what they mean. At the very least, mantras train the mind on positive and uplifting thoughts so that our lives come into alignment with those intentions. The concept of a guru merits a novel on its own, so I’ll have to expand on this later, but here’s the short version: Guru means “teacher” or “master,” but it can refer to different things. Sometimes, a guru is a literal teacher, someone who tells you what you need to do to become enlightened or just to take the next step in your journey. I prefer to talk about the inner guru, the part of yourself that is connected to all of nature and is therefore deeply wise, even if you aren’t consciously aware of it. And finally, there’s the idea of the divine itself being the ultimate guru or teacher. In terms of in-the-flesh gurus, you will find many wonderful teachers in the world, but I will warn you: humans are humans are humans. I don’t care how wise a teacher may be–he or she is not above reproach. Anyone with that elevated status has an opportunity to take advantage of others. I’m not saying you shouldn’t trust these people if they are good teachers, but do not subjugate yourself to them. A teacher’s job is to nurture the growth of the student. If his or her actions don’t reflect that goal, reject them as teachers. So, do I need a teacher? Having a teacher really helps when you’re starting out, but you don’t have to go to India or buy a ticket to see a traveling guru in your town. You can try going to a yoga studio, a Unitarian church, or a local Buddhist temple if you would like some in-person guidance. You can also read about meditation as taught by some really wonderful teachers. The first meditation book I ever read was Everyday Zen by Charlotte Joko Beck, and it’s a very practical guide to incorporating mindfulness into your daily life. You can even search Youtube for teachers like Pema Chodron who is extremely wise and compassionate in her talks. In other words, having a teacher is great, but once you’ve got the desire to learn, there’s nothing stopping you from making progress, with or without a teacher. Why do you have to sit up straight to meditate? If the body is reasonably strong, sitting up straight is actually the least strenuous position for the body aside from lying down. When your spine is aligned properly (in neutral), the head is up straight and the shoulders are relaxed. This allows the bones to bear the body’s weight so the muscles can relax and the mind will not be distracted. We do asanas (yoga poses) before meditating so the body will be strong but supple and able to sit for long periods comfortably. That is the real reason for doing yoga poses–remember, when yoga started out, there was no need for the kind of fitness classes we have today. Why can’t I meditate lying down? Because you will fall asleep. If you’re using a meditation practice to help you fall asleep, go for it. However, the general idea of meditation is to learn to be present and serene in our waking lives, so falling asleep in the middle of it is somewhat counterproductive. If you have a physical limitation that prevents you from sitting upright to meditate, lying down is perfectly acceptable. Does it matter where you meditate? Yes and no. No because you can meditate anywhere at all. The place doesn’t have to be beautiful, and in fact, sometimes you can get so distracted by staring at the beautiful view or searching for the perfect surroundings that you’re actually detracting from your practice. That’s no good, obviously. On the other hand it does matter in a way. First, if you have a beautiful place in your home dedicated to meditation, you’ll look forward to going there. Second, if you practice in a quiet place, it’s easier to focus — especially at the beginning! Third, being comfortable doesn’t hurt! Finally, setting up your meditation space is an outward display of respect for the practice itself. Many people (myself included) find that cultivating reverence for the meditation practice is good for our dedication to it. That’s it for the meditation guide. I hope you’ve found it helpful and that you’ll start incorporating meditation into your daily life. If you have more questions, let me know in the comments or via the contact page.